Simon & Schuster, 9781501145254, 400pp. The New York Times bestselling book from Supreme Court Justice Ruth Bader Ginsburg—“a comprehensive look inside her brilliantly analytical, entertainingly wry mind, revealing the fascinating life of one of our generation's most influential voices in both law and public opinion” (Harper’s Bazaar). 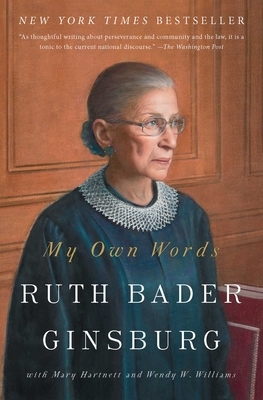 My Own Words “showcases Ruth Ginsburg’s astonishing intellectual range” (The New Republic). In this collection Justice Ginsburg discusses gender equality, the workings of the Supreme Court, being Jewish, law and lawyers in opera, and the value of looking beyond US shores when interpreting the US Constitution. Throughout her life Justice Ginsburg has been (and continues to be) a prolific writer and public speaker. This book’s sampling is selected by Justice Ginsburg and her authorized biographers Mary Hartnett and Wendy W. Williams, who introduce each chapter and provide biographical context and quotes gleaned from hundreds of interviews they have conducted. Witty, engaging, serious, and playful, My Own Words is a fascinating glimpse into the life of one of America’s most influential women and “a tonic to the current national discourse” (The Washington Post). Born in 1933, Ruth Bader Ginsburg attended the Harvard and Columbia University Law Schools, and taught law at Rutgers and Columbia. During the 1970s, while teaching at Columbia, she was instrumental in launching the ACLU’s Women’s Rights Project, and became the leading advocate in the Supreme Court for gender equality. She was appointed by President Jimmy Carter to the US Court of Appeals for the DC Circuit in 1980 and to the US Supreme Court by President Bill Clinton in 1993. In 2009 Forbes named Ginsburg among the 100 Most Powerful Women, Glamour named her one of their 1993 Women of the Year and in 2012 presented her with their Lifetime Achievement Award. In 2015 Time listed her as an Icon in the Time 100, and in 2016 Fortune named her one of the World’s Greatest Leaders. Mary Hartnett is an Adjunct Professor at Georgetown Law, focusing on international women’s human rights. Wendy W. Williams is Professor Emerita at Georgetown Law, best known for her work in the area of gender and law, especially concerning issues of work and family.